Spring has well and truly sprung on Fraser Island and we, and indeed the whole of Queensland, have been enjoying unseasonably warm days. With spring comes the arrival of wildflower season on island and the resulting sweet Banksia nectar and other blossoms around Kingfisher Bay Resort have left our native stingless bees (Tetragonula and Austroplebeia) absolutely buzzing! 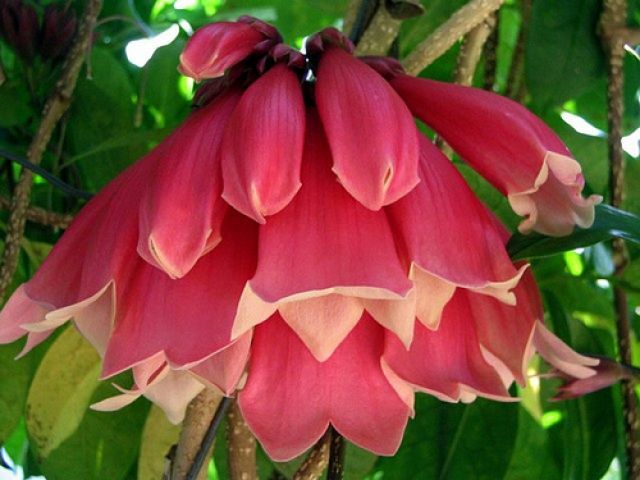 Earlier this month, we spotted our Fraser Island Creeper (Tecomanthe Hillii) in bloom poolside and near the resort hotel rooms in our Awinya wing. This beautiful twining climber vine is easily identified by its long, pinkish-cream to red coloured flowers and glossy, green woody foliage and is endemic only to Fraser Island and parts of the east coast of Queensland. From flora to fauna and Fraser Island’s natural diversity is also showcased superbly at this time of year as native creatures including snakes, lizards and turtles and come out of brumation (a state similar to hibernation, but animals 'wake up' to drink water) slumber. This month we have seen an increase in sightings of one of Australia’s most iconic fauna species, the Short-beaked Echidna (Tachyglossus aculeatus), see video below, which has been spotted along our shoreline and in the open eucalypt forest surrounding the resort, much to the delight of staff and guests alike. Thanks to Ranger Luke for capturing this fella, whom we have nicknamed Spike, on his iphone. 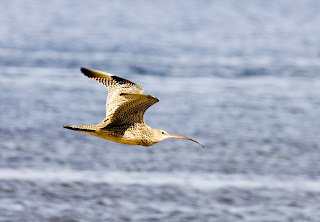 Spring time is also the time of year that we see the annual return of our Asian migratory birds (like our Whimbrels and Curlews) from countries as far as Mongolia and China to our shores. Fraser Island’s isolated beaches and Ramsar-protected wetlands (wetlands of international importance) provide the ideal place to rest their weary wings and feed - particularly as they can lose up to 40% of their bodyweight during their travels. It is only through the conservation of these habitats that the island (and Hervey Bay) can retain its rich abundance of bird life. Already this season, we are seeing the return of species such as the Eastern Curlew (Numenius madagascariensis) to the beach front near the resort. This bulky, dark coloured bird is the largest shore wader in the world and chases an endless summer by migrating between the Northern and Southern Hemispheres. Listen out for a loud, sad-sounding ‘cuuuuuu-leee’ sound that rises in pitch and if you see them, please remember to keep your distance and let them rest as they have another several thousand kilometres for their return journey. DID YOU KNOW that Eastern Curlews have very long legs, allowing them to wade in boggy areas and moorland in their breeding region, where other shorter-legged waders are unable to go? We are also seeing the arrival of the next generation of our purebred Fraser Island Dingoes (Canis lupis dingo) out and about on island. Dingo dens are often hidden in areas such as a hollow log or in a hole dug under the roots of a tree in the Great Sandy National Park. Each litter can contain 2 to 6 pups and they usually become independent around the age of 3–4 months, or if in a pack, when the next breeding season begins in April. FUN FACT: Dingoes have unique wrists in the canine world that are capable of rotation. This enables them to use their paws like hands and they are even capable of turning door knobs… but they certainly haven’t mastered our dingo fence latches! Younglings’ tracks have been spotted on the western beach of Fraser Island (outside the resort’s dingo fence) right alongside their mothers on our daily guided eco walks and photographs of dingo tracks are always great Fraser Island souvenirs. It has also been a busy month in around the resort in terms of wildlife rescue and relocations. Our cheeky Bar-shouldered Doves (Geopelia humeralis) are particularly fond of our Centre Complex and are regularly removed from inside the hotel when they get confused and can't find their way out again. The team here also rescued an injured Australian Pied Cormorant (Phalacrocorax varius) and delivered it straight to the RSPCA to be nursed back to health. These cheeky divers often steal bait from the ends of fishermen's lines off our jetty and need our assistance to get unhooked. We’ll that’s September covered tree huggers, stay tuned to see what Fraser Island unearths next month.